A police report on the death of Michael Brown is missing key information and violates Missouri open records laws, an ACLU attorney told Yahoo News on Friday. The two-page document, which the Ferguson Police Department released only after pressure from journalists and civil liberties advocates, is largely redacted or left blank. The most egregious omissions are the victim’s name and a description of the offense — the fatal shooting of Brown. “They are breaking the law,” said Tony Rothert, legal director of the ACLU of Missouri. The report, obtained by Yahoo News through the Missouri Sunshine Law, lists only the date, time and location. Fields for the type of incident, name of the complainant, and a summary of the circumstances are redacted. Click image to read entire report. The report comes nearly two weeks after Ferguson Police Officer Darren Wilson fatally shot Brown, an unarmed 18-year-old, in broad daylight in the middle of a residential street. Ferguson Police Chief Thomas Jackson has said Wilson was attempting to get Brown and his friend, Dorian Johnson, to stop walking in the middle of the street when the officer realized the pair fit the description of suspects being sought in the theft of cigars from a nearby convenience store. A scuffle ensued and, according to Jackson, a shot was fired inside the officer’s squad car as Brown attempted to grab Wilson’s gun. But Johnson has told reporters that it was Wilson who was the aggressor and that Brown never went for the weapon. Instead, Johnson says, Wilson shot his friend while Brown was trying to flee but had stopped and put his hands up in surrender. 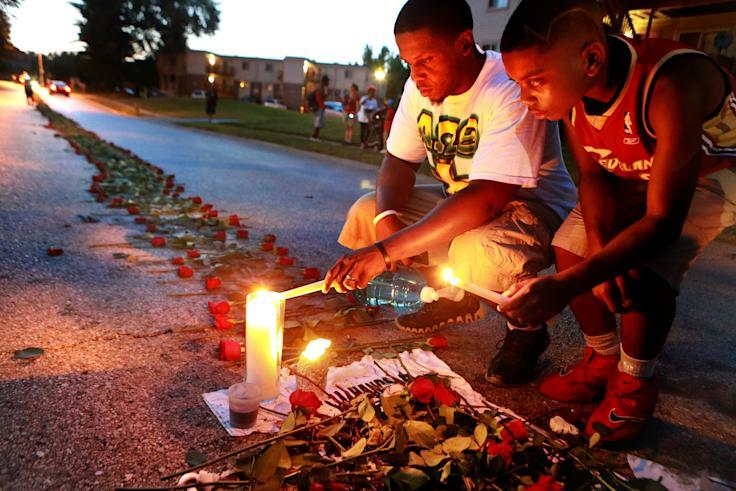 The death has sparked nightly protests in the mostly black St. Louis suburb. Allegations of racism and a lack of transparency about the shooting have been at the heart of sometimes violent clashes between demonstrators and police. Chief Jackson waited nearly a week before revealing the name of the officer who shot Brown at least six times. The ACLU filed a lawsuit to try to compel Ferguson to make the disclosure. But its attorney told Yahoo News that the incomplete police report just adds to the mistrust in Ferguson. Devin James, a contract spokesperson hired by the City of Ferguson since Brown’s death, told Yahoo News that questions about the report’s missing information “are beyond the scope of what my team can respond to.” He referred questions to City Attorney Stephanie Karr, who didn’t immediately reply. Officer Wilson, 28, is on paid leave pending the outcome of multiple investigations. A St. Louis County Circuit Court grand jury began hearing testimony about the shooting this week. The U.S. Department of Justice is also investigating possible civil rights violations. The state investigation is being conducted by the St. Louis County Police Department. A copy of its offense report does list Brown as the victim but doesn’t give a summary of what happened. The county’s report reveals that the larger metro department didn’t receive a call on the Aug. 9 shooting until 12:43 p.m., about 40 minutes after Brown was killed. Last week, Chief Jackson gave members of the media 19 pages of police documents, photos and video from a convenience store robbery that occurred shortly before the fatal shooting. Police said they believe Brown and Johnson had just stolen cigars at the store before crossing paths with Officer Wilson on their way home.